The Gabriola Arts Council is hosting their second annual fundraiser gala on January 30, 2016 at the Community Hall! 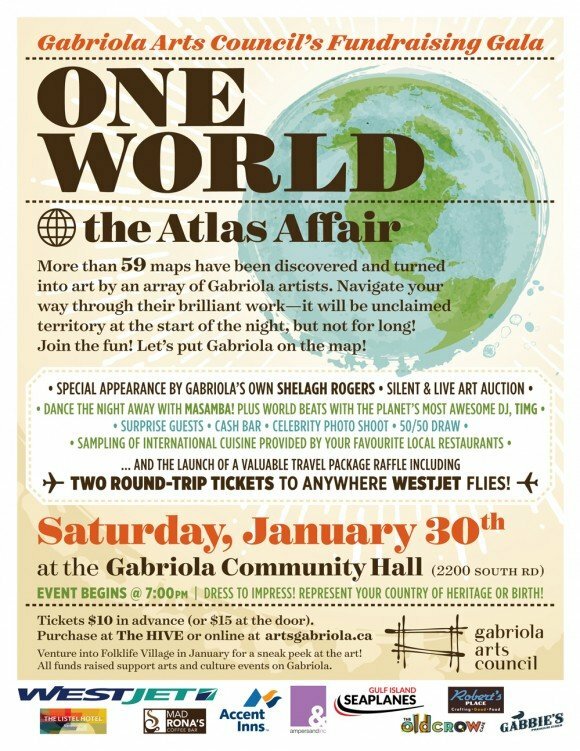 ONE WORLD: The Atlas Affair—the follow-up to last year’s insanely fun Chair Affair—will feature the work of sixty Gabriola artists who have ventured into uncharted territory, and transformed simple maps into spectacular pieces of art! Navigate your way through their brilliant work—and maybe one of the special works will find its way into your home. Hosted by Gabriola’s own Shelagh Rogers, this exciting event will be packed with activities and entertainment! First and foremost, come to see what the artists have created, then bid on their work through the live and silent art auction. Groove to world beats from DJ Tim G, witness a jaw-dropping, travel-themed performance by Surprise Guests, and nosh on international hor d’euvres prepared by your favourite local chefs—and served by local teens! Try your luck at the 50/50 draw, become famous at the celebrity photo shoot! And to finish the evening—dance the night away to the groovy tunes of Masamba! If that’s not enough, we’ll be officially launching the raffle for a valuable Travel Package including two round-trip tickets to anywhere in the world Westjet flies! Dress to impress—come representing your country of heritage or birth! All funds raised support arts and culture events on Gabriola. Want a sneak peek at the art? Venture into Folklife Village to see it displayed in the windows of the pop-up gallery! Tickets are $10 in advance, online below or at The Hive. Only 250 tickets available—it sold out last year, so get your tickets early! One World, Atlas Affair Jan.30! ← How To Be a Great Board Member!